The information and recipes on the neolithic, paleolithic, bronze and iron age are really interesting. The information on medieval Denmark is also interesting and well written. Those chapters are excellent with a lot of good information and Buhl tend to explain how we know this or that as well – which I really like. It isn’t dull but isn’t pop-history either. 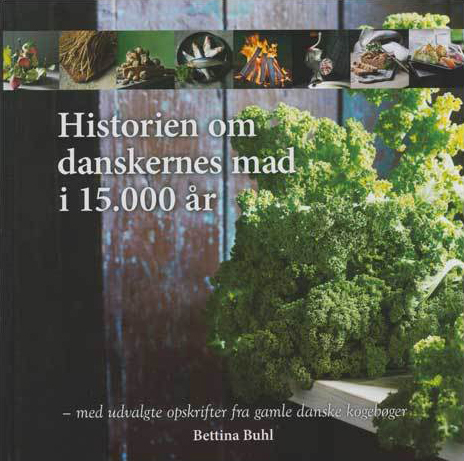 The book has some nice list of common ingredients and did tell me when a lot of food items were introduced in Denmark. For instance the carrot seem to be a rather late edition (something I want to check though). Sadly this approach seem to disappear once we get to the 1700’s where the book gets filled with colorful anecdotes without sources. It makes the information less believable in my mind – and quite easy to dismiss. Which really annoyed me. The book has a heavy focus on farmer’s food – that is fine but it isn’t where my personal interests lay – because most of it is really boring food. Or perhaps rather the anecdotes makes it seem that way – lots of it is properly perfectly fine if I actually made it. But the book doesn’t make me want to try the food of the later period. I have to comment on the layout a bit. Most of the book has a really nice easy to read layout with good information boxes, lots of pictures and good image texts. I really appreciated that. However the pages with the recipes are a mess. They are cramped the pictures are less interesting and there are like 10 recipes on one spread. That is really a shame because I think some of the recipes are properly quite good. Overall: I liked the first third of the book quite a bit. The rest I would have been without. I am glad I borrowed it and read it but I will not be buying this one.